TallyGenicom Mobile Impact Printer | OhGizmo! 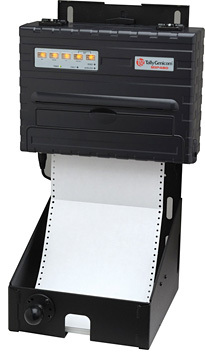 I have to give the dot-matrix impact printer some credit for managing to find itself a niche that has helped this technology avoid complete extinction for all these years now. The TallyGenicom MIP 480 is actually a mobile impact printer that is designed to be mounted in vehicles or other areas where space is at a premium. At 480 characters per second it’s also the fastest mobile impact printer on the market. And while the printing technology itself is a bit dated, the MIP 480 will easily integrate into a modern business setting with Bluetooth and 802.11 connectivity. Of course it also still supports both a parallel port and an RS-232 serial port connection if needed. The TallyGenicom MIP 480 is currently available for ?560.